This volume, Volume 1, covers the early Chicago years and the Prairie Houses, the period which provoked a profound influence on European architects. Wright's architectural work during these early years was mostly residential, as it would be throughout his career, and from his earliest work, Frank Lloyd Wright demonstrated a knowledge of and respect for natural materials. In the ten years between 1896 and 1906 he developed and perfected the so-called "prairie house". Wright believed the architect should have complete charge of architectural design, and for him this meant interior furnishings as well as exterior landscape. He was not often given this freedom, but the 1908 Avery Coonley residence in Riverside, Illinois is one of the finest examples. With the administration building for the Larkin Soap Company (1903-1905) and the Unity Temple (1905) he could realize bigger commissions. In 1910 he worked on his famous publication "Ausgeführte Bauten und Entwürfe" for the German publisher Wasmuth, which brought his ideas to a worldwide recognition. The personal tragedy of 1914 brought a shadow over his successful, but struggled life: A servant at Taliesin had set fire to the residence and murdered his mistress Mamah, her two children, a draftsman, and three workmen. 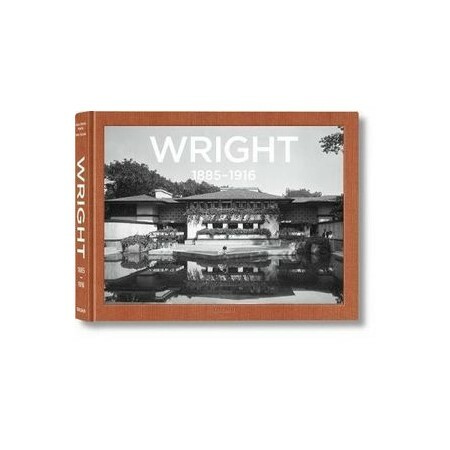 But this could not stop Wright on his permanent search for a new architecture. Bruce Brooks Pfeiffer became Frank Lloyd Wright's apprentice at the Taliesin Fellowship in 1949. In 1957, he attended the Ecole Nationale des Beaux-Arts in Paris, returning in 1958 to continue his apprenticeship with Wright until his death in 1959. He remains at Taliesin to this day, as director of the Frank Lloyd Wright Archives, a vice-president of the Frank Lloyd Wright Foundation, and author of numerous publications on Wright's life and work. Peter Gossel runs a practice for the design of museums and exhibitions. He is the editor of TASCHEN's monographs on Julius Shulman, R. M. Schindler, John Lautner and Richard Neutra, as well as the editor of the Basic Architecture Series.